Bexar County DA Nico Lahood has announced people will no longer be arrested for small amounts of pot in San Antonio, implementing a system for officers to issue citations under a 2007 law passed by the Republican House Corrections Committee Chairman Jerry Madden, now with Right on Crime. See coverage in the Express News, which included a chart, appended after the jump, detailing the extent of marijuana arrests in recent years in the River City. Should decarceration advocates push for federal reforms? Writing in Vox, John Pfaff dislikes Cory Booker's Reverse Mass Incarceration Act for two principle reasons. First, he thinks it reacts to a misdiagnosis, seeking federal legislation because liberals to his mind wrongly blame the Clinton 1994 Crime Bill for the rise of mass incarceration. Pfaff thinks its role is overstated and that federal legislation can't do much to reduce incarceration in the states. Second, he thinks it will unnecessarily gin up enemies - in particular prison guards and prosecutors. Grits thinks these concerns are overblown. Yes, the role of the 1994 Crime Bill has been overstated. But Pfaff undersells its importance in galvanizing support for tuff-on-crime legislation in the culture at large, and especially among Democrats, that trickled down to the state level. (In Texas, for example, the push for it helped sell Ann Richards' concurrent billion dollar bond issue she pushed to triple the size of our prison system.) Booker's bill, or perhaps a more bipartisan version, theoretically could do the same for 21st century pols, especially among the GOP, where the Right-on-Crime movement provides a ready vehicle for conservatives who wish to embrace justice reforms. Second, it's a huge mistake to fantasize that decarceration can be achieved without fighting the institutional opposition like prosecutors, police unions, prison guards, and Chamber-of-Commerce types from rural prison towns. They're going to fight because their interests are threatened. Avoiding the fight is impossible and change can't happen until the fight is won. So Grits sees little sense in putting it off. The thing to do is pick the field of battle with the greatest near-term hope for success and begin slugging it out. In my own experience, the processes such conflicts generate - the back and forth, the interrogation of claims, the debates over values, the competing demands on politicians, and even the interest-splitting compromises - are in fact how change occurs in a (small-r) republican system: Slowly and incrementally, the same way mass incarceration was created. But that won't occur unless we start, everyone should start where they are, and since Cory Booker is in the US Senate, to Grits, it's fine if he starts there. For nearly 20 years now, the Texas Legislature and the Texas Court of Criminal Appeals have been battling over who should get access to post-conviction DNA testing, with the Lege pushing for broader testing and the CCA doing its best to limit it. Larry Swearingen's capital case, in which he's claiming actual innocence in the murder of Melissa Trotter, is the latest salvo in this debate. See Jordan Smith's excellent coverage in The Intercept for a primer on the issues at stake. Harris County DA Kim Ogg has ended the department's practice of prosecuting people for trace amounts of drugs, often scraped from pipes or scraped from car floormats, etc.. See good coverage from the Houston Press. Said Nick Hughes from the Harris County Public Defender Office, "People who are particularly at risk of being wrongfully convicted for possession a controlled substance are almost always the people who are accused of possessing less than a gram. That’s the stuff you find on the floorboards, on the seats, where they're just really reaching to make a prosecution, and it’s particularly dangerous right now when were not testing drugs with field tests." Alexandra Natapoff has a nice essay praising snitching reforms in Texas passed this year and suggesting additional reforms based on proposals in other states. Pro Publica is trying to get source code for the black-box software interpreting DNA mixture evidence for the New York City medical examiners office. See Grits' earlier discussion and segments from the August and September Reasonably Suspicious podcasts for more on this issue. Both juvenile crime and juvenile detention rates have plummeted over the last decade. See a pair of articles (Pew, NPR) explaining the trend. See coverage of a comprehensive meta-analysis of the effect of mass incarceration - and reducing it - on crime, as well as a summary in a series of blog posts. "The crux of the matter is that tougher sentences hardly deter crime, and that while imprisoning people temporarily stops them from committing crime outside prison walls, it also tends to increase their criminality after release." We've learned over the last year or so that many rural counties are incarcerating people at far higher per-capita rates than urban ones. So I'm glad to see philanthropic resources going specifically to develop decarceration strategies for small and rural counties. That debate is overdue. Here's a good discussion of how driver-license suspension laws related to debt collection drive up poverty rates, especially in states with Driver Responsibility Surcharge programs. The American Conservative offered up "Seven Reasons Why Police Brutality is Systemic, Not Anecdotal." It includes these remarkable bits of data: "A Department of Justice study revealed that a whopping 84 percent of police officers report that they’ve seen colleagues use excessive force on civilians, and 61 percent admit they don’t always report 'even serious criminal violations that involve abuse of authority by fellow officers.'" When you look at the study, the 84 percent didn't say they'd "seen" excessive force but merely knew of it. But still. Wow. Also in that study, more than 67 percent of surveyed officers agreed that, "An officer who reports another officer’s misconduct is likely to be given the cold shoulder by his or her fellow officers." So that's a likely motive for not reporting. Police unions have been under fire lately for protecting bad cops, opposing reforms, and engaging in bullying behavior in response to public criticisms of unwarranted police shootings. So, in the wake of this latest round of attention, let's take a look at the police-union playbook when it comes to responding to controversial police use of force incidents. In the most recent Reasonably Suspicious podcast, we discussed a book just out this year coauthored by Ron DeLord, the former head of the Combined Law Enforcement Associations of Texas and one of the most important voices in the country on police labor matters. 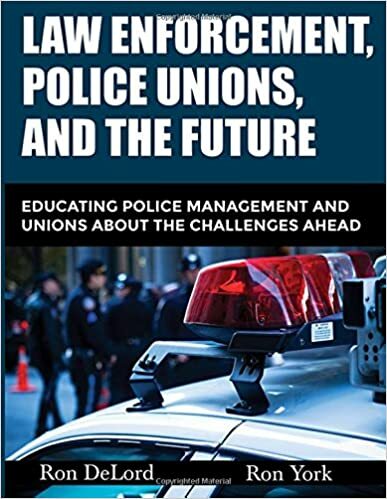 The book was called "Law Enforcement, Police Unions, and the Future: Educating Police Management and Unions About the Challenges Ahead." In the podcast, we talked about the authors' analysis of police pension politics. But today we turn to Chapter 11, titled, "What Every Union Leader Needs To Know About Dealing With The Media In A High Profile Incident." The chapter opens with a quote from Malcolm X. "The media's the most powerful entity on earth. They have the power to make the innocent guilty and to make the guilty innocent, and that's power. Because they control the minds of the masses." Argues that, in racially charged debates, union leaders may need to sacrifice individual members to the media maelstrom because, "If the unions stands directly in the blast and tries to stop it, the blast will overwhelm and discredit the union and the officers it represents." They gave an example in which "the officers were terminated and the union received favorable press." Specifically, "The union should look to see if management or elected officials are overreacting and have jumped to conclusions about the 'guilt' of the officer or officers." Then single that person out and attack them. "The union's attack on the offending officials will start a war of words between the parties and distract the media." "If the high profile incident appears to be really bad and there is no logical explanation in the initial aftermath that the union can give to the media and the public for the officer's actions, the union should wrap itself in the flag." Further, "The union may consider going on the offense at this point." For example, "If the incident has racial overtones, make the message that the debate is about criminals, not race." Most high profile incidents begin "when someone starts acting badly or breaking the law, so they suggest that unions investigate the victim ("get the public record on this person") and publicly blame them. They add, "If the incident involves a carload of preachers, revisit Rule Number Three (Wrap Yourself In The Flag)." They encourage emphasizing how dangerous police officers jobs are and advocate taking reporters to ride along with officers, attend training classes on tactics, or participate in shoot-no-shoot exercises. Drag everything out as long as possible, they advise, and the public will eventually move on. "The longer a high profile incident is off the front page, the easier it is to resolve the case" because "The judge or arbitrator assigned to these cases sometimes feel more media and public pressure immediately after an incident than a year or so later. The more controversial the incident, the more time is your friend." They encourage the union to cultivate relationships with businesses and community activists because often they "will step forward to defend police officers in controversial cases. If community leaders come to the defense of their officers, it may lessen the likelihood the officers will face criminal charges, especially if the prosecutor has an elected boss. It may sway management away from severe disciplinary action." For union leaders, "The only sin is not expecting anything to happen that would be characterized by the media as controversial." Because it will. "It is not a matter of if, but when the crap will hit the fan." So prepare accordingly. So there you have it. Maybe some of our journalist friends thought that was the playbook - anyone who's watched these episodes closely over time recognizes the pattern described above - but now you know it from the horse's mouth. TCJC reviewed all arrests in Harris County over a 16-week period from July 13, 2016, to October 5, 2016. Texas law already prohibits officers from arresting a person for speeding. Such an arrest constitutes officer misconduct. And yet, among those in the dataset reviewed by TCJC who were arrested on a single traffic charge, this was the most common offense. Like Professor Gershowitz, I'd considered Harris County's intake prosecutors a best practice before seeing these data. But all these Class C arrests cause me to question how much of a constraint these prosecutors are really providing? Year-to-date murder totals in 2017 are headed back down, according to published reports, but those mid-year estimates are often wrong. One simply must have patience before declaring a trend either way; data can't be manufactured which doesn't exist yet. Regardless, Grits would consider three years in a row of increases a full-blown trend. If it drops back down, then from a statistical perspective, maybe the increase was just noise and the trend could even continue in the other direction. ¿Quien sabe? Either way, as Pfaff points, out, reformist policy prescriptions don't really change. We don't prevent violent crime by incarcerating low-level nonviolent offenders, arresting people for traffic-ticket debt, or keeping elderly, parole-eligible inmates incarcerated long after they cease to pose a public safety threat. Indeed, so many criminal-justice methods have been proven ineffective and counterproductive - e.g., evidence now strongly shows that incarcerating low-risk offenders increases their recidivism rates - that, if crime is rising, it becomes more imperative than ever to reform the justice system to focus on people who pose the most serious risk. Resources are scarce in the post-Harvey era and it doesn't make sense to spend them on anachronistic policies that don't work. RELATED: From the Texas Tribune, "Texas murder rate went up again last year, remains relatively low." At the risk of seeming a bit too Pollyannaish, I think the FBI report that property crimes in 2016 dropped for the 14th consecutive year is a big piece of the national crime story very much worth celebrating. Though violent crimes rates understandably get the most attention, property crimes impact the most people — there are, roughly speaking, more than five property crimes for every violent crime — so drops [in] property crimes can end up meaning a lot more persons and families experienced a crime-free year even when there are spikes in violent crime. AND MORE: From Thomas Abt in the New York Times. At the Marshall Project, Alysia Santo has a story titled, "How conservatives learned to love free lawyers for the poor," telling the story of an Idaho legislator and conservative activist who successfully spearheaded indigent defense reforms there. Grits thought it would be useful to highlight some of the messaging that helped them succeed. Perry framed the idea in terms of another issue she knew the gun show attendees felt passionately about. for the growing coalition of conservatives working to reform public defense, race isn’t the central issue. Poor white defendants are being failed by the public defender system just as non-white ones are, they contend. According to the Bureau of Justice Statistics, which last conducted a survey on this subject in 1997, 69 percent of white inmates in state prison said they had court-appointed lawyers, while 77 percent of black and 73 percent of Hispanic inmates did. Many conservatives believe that pointing out racial disparities in this context is polarizing and counter-productive. says looking at the issue through the lens of big government overreach — or what he calls “the tyranny prism” — may provide results that the left ultimately cannot argue with, even though it means sacrificing a central tenet of their ideology.“A tyrannical government hurts those with the least voice in the political process first, including the poor and people of color,” Carroll says. “Tyranny explains what people on the left want to explain, that the criminal justice system has disproportionate impacts on people of color.” But conservatives are often hesitant to declare the system racist, he said. “The tyranny prism is a framework that allows conservatives to be at the table, too." Grits is reminded here of Texas' House Committee Chairman James White's invocation of the word "tyranny" in his interview in July on the Reasonably Suspicious podcast. He complained of the "small tyranny" of arrests for unpaid traffic fines as opposed so some of the greater tyrannies involved in wrongful convictions, etc.. The "tyranny" frame is a flexible and powerful one, with a great deal of explanatory value in the same situations where liberals may seek to impose racial explanations. Racial debates in America are fundamentally about power, and the powerless may be victimized by "tyranny" regardless of skin color. And there's always the economic framework: "For many conservatives, reform is also about saving taxpayer money, since it can reduce the costs of unnecessary incarceration, endless legal appeals, and lawsuits from those wrongly imprisoned." Meanwhile, some conservative lawmakers who became passionate about indigent defense have turned their sights on other examples of what they see as abuses in the criminal justice system. In Michigan, McMillin continued his partnership with the ACLU, drafting legislation to limit civil asset forfeiture and warrantless police searches. So for whomever replaces Jim Bethke at the Texas Indigent Defense Commission, there's your red-state reform messaging. There's a little something in it for everyone. Some lefty advocates in the story worried that failing to frame the issue in terms of race would doom reforms, with one wag suggesting that the tactic amounted to "putting a Band-Aid on cancer." But in Texas, many criminal-justice reform victories have hinged on similarly framing the topics in terms of conservative values and couldn't have passed otherwise. Based on that experience, Grits can say with certainty that the racial disparity issues still get discussed under this approach. Always. Once this debate is launched, racial disparity issues inevitably come up. But they do so in the context of a framework that includes approaches conservatives can countenance. What you're seeing here is the real-world implementation of an idea Dan Kahan has discussed, framing issues with enough ambiguity so that different actors in the system can support a proposal based on different value systems. Liberals who want to view indigent defense through a racial disparity frame remain free to do so. But this approach gives the large number of white folks on the other side of those culture-war debates a way to agree with a surprisingly large number of policy prescriptions with which liberals can wholeheartedly endorse. Find a transcript of his speech after the jump. In Michigan, state prisons arrest visitors who arrive with outstanding traffic warrants, running their names and arresting them while they wait, the Marshall Project reported. Grits emailed Jason Clark, spokesperson at TDCJ, to ask if Texas prisons did something similar. For the record, he replied, "No sir, we do not." TDCJ is ending the use of solitary confinement as punishment, and the number of people in ad-seg overall continues to drop precipitously. "Before the administrative change was implemented this month, Texas prison officials had made sharp reductions in its solitary confinement population. In August 2013, there were 215 inmates in punitive solitary confinement. By July 2017, that number was down to 76. In the same time frame, the number of inmates placed in administrative segregation decreased from approximately 7,200 to 3,940." Why no Texas 5th Circuit nominations yet? Judge orders AC for some Harvey-displaced prisoners. Read Brandi Grissom on Texas' latest snitching reforms, and a case study supporting them published last year. The Texas Tribune quoted the national Innocence Project saying that, with Texas' newest innocence statute, our law represented the "gold standard" among states on innocence reform. Read the Texas Public Policy Foundation's Greg Glod on why Texas' cash bail system is "costing us all a fortune." More on this later but the Texas Indigent Defense Commission has produced a "primer" for operating "managed assigned counsel" systems. These are basically the counter-proposal by the Texas defense bar to the push to create real-deal public defender systems. MAC systems are IMO a better situation than straight-up judicial appointments, but not by much. In Austin, Grits has not observed that the managed assigned system has resulted in significant improvements in indigent representation. There's a risk of nearly-impossible-to-root-out corruption and self-dealing by the defense bar. This is basically a regulatory system that's been captured by the regulated parties. Here's an academic article on, "Changing the Culture of Disclosure in Forensics" which gets added to Grits' to-read pile. First, The Crime Report had an interview with Texas state representative and House County Affairs Committee Chairman Garnet Coleman on passage of the Sandra Bland Act. Coleman's comments were more measured, but the story included an unfortunate headline: "How Texas turned the page on police reform." To be clear: Texas has done no such thing. Coleman's bill mainly addressed mental health issues and mandated Texas cops receive deescalation training. But Texas' big police reform bill died on the vine this year, and the most important reform elements in Coleman's bill - eliminating arrests for most Class C offenses and mandating bail for non-dangerous misdemeanants - were removed before passage. The Sandra Bland Act was significant, positive legislation and Grits doesn't want to diminish its importance, but let's please slow our roll on the whole dusting off our hands, problem-solved meme. Will legalized long knives change how Texas cops deal with knife wielders? Now that Texas has legalized people carrying knives and swords of any size, perhaps the issue of how quickly police shoot knife wielding suspects will be revisited. This essayist in Slate makes a good point, with an homage to Dallas News columnist Steve Blow, disputing the adage that the “No. 1 duty of a police officer [should be] to go home to his or her family at the end of the shift.” Here's the money quote the writer pulled from Blow's March 2015 column. This modern dicta of 21st century policing ultimately undermines the public's faith in law enforcement as surely as do unfounded criticisms of racism with which police officials are so much more deeply concerned. After all, as the Slate author concluded, "The reason we revere cops isn’t their dedication to protecting their own lives. It’s their dedication to protecting ours." The Heritage Foundation has published an odd "special report" purporting to summarize a convening they sponsored of various law enforcement officials. However, upon looking at the stakeholders' disparate remarks appended therein, Heritage oversold any notion of consensus, and in fact revealed significant disagreement among its (one-sided) array of stakeholders. According to Heritage, "police have had few allies," and "anti-police rhetoric has left Americans, particularly those living in low-income communities and minority communities, more at risk." But they overstated the consensus. E.g., the explanatory text under a headline which read, "Allegations of 'Systemic Racism' Are False and Harmful," actually read, "Some attendees agreed that the concept of broad 'systemic racism' in law enforcement is a damaging, false narrative that undermines public support for policing. Others felt it important to acknowledge and address past wrongs and prior grievances in order to improve race relations." That range of views hardly supports the subhed! Regardless, Heritage warned darkly that "long-term declines in crime rates ... are now being threatened by some of the developments discussed in this Special Report." This deserves a more thorough vetting than Grits has time to apply at the moment, but I wanted to flag the link. Elizabeith Joh, "The undue interest of surveillance technology companies on policing." Frederick W. Turner II & Bryanna Hahn Fox, "Public servants or police soldiers?" Adam Gershowitz, "The Intake Prosecutor: Prosecutorial screening before police make warrantless arrests." Reasonably Suspicious: Listen to the podcast, join us for our Launch Party! After several months of working out the kinks in a soft launch, Just Liberty's Reasonably Suspicious podcast now is up and running on numerous platforms - iTunes, Google Play, YouTube, SoundCloud, etc.. Please subscribe and give it a try! I'm proud of the results so far, and we're improving every time. Just Liberty will host a podcast launch party in Austin on Wednesday, September 20th to celebrate the new project. Please join us if you can! See our Facebook event page for details. You can listen to the podcast here, or as usual find a transcript with links to underlying documents and news stories below the jump. 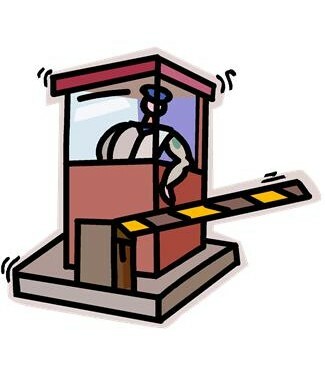 Why do judges frequently fail to keep faulty forensics out in criminal cases despite the fact that they rigorously enforce Daubert’s gatekeeping requirements when presiding over civil cases? Daubert requires trial judges in both civil and criminal proceedings to determine “whether the reasoning or methodology underlying the testimony is scientifically valid.” As the relevant research reveals, however, judges are far more willing to fulfill their gatekeeping roles in civil cases than criminal ones. Challenges to forensic evidence pretrial, including Daubert hearings, are rare in the criminal context. As the NAS Report makes clear, “the vast majority of the reported opinions in criminal cases indicate that trial judges rarely exclude or restrict expert testimony offered by prosecutors.” The evidentiary standards that apply to expert forensic evidence should be identical in civil and criminal proceedings according to the Federal Rules of Evidence and relevant precedent, yet courts rigorously engage in gatekeeping of such evidence in civil proceedings while giving broad leeway to prosecutors in criminal proceedings. Therefore, the courts’ failure to exclude faulty forensics in criminal cases cannot be explained away simply by pointing to judges’ lack of scientific prowess. In Just Liberty's next Reasonably Suspicious podcast, out tomorrow, Mandy Marzullo and I discuss the failure of Texas courts so far to adequately perform their gatekeeping function vis a vis DNA mixture evidence, updating a segment from last month's edition. The passage above from an academic article gets to the heart of the matter: Though in theory, civil and criminal courts should be applying the same standards for scientific evidence, as a general rule they only perform a true "gatekeeping" function on the civil side. In the past, Grits has been a tad more generous, attributing this outcome to lopsided disparities in resources on the criminal side, while civil disputes are often more equally matched in terms of both sides' ability to hire independent experts, etc.. But the reflexive posture of admitting anything the prosecution wants until their hand is absolutely forced - even disputed evidence like bite marks, hair microscopy, and black-box DNA mixture analyses - after a while becomes hard to deny. The other segment on forensics in tomorrow's podcast discusses Texas' junk science writ, assessing a law professor's comparison between our version and California's. Left unsaid in that segment is that the reason we need habeas corpus remedies for bad science on the back end of the process primarily stems from judges' failure to perform a meaningful gatekeeping role on the front end. Well, I suppose now it hasn't been left unsaid. Beverly Harrison, The Marshall Project, "A Decades Old Conviction Cost Me My Post-Retirement Job"
Jayson Hawkins, The Marshall Project/Vice, "Sentenced to Life in Prison: And a Job Making Furniture"
Jorge Renaud, Texas Observer, "The Road to Huntsville"
Meanwhile, with tens of thousands of drug overdose deaths making national headlines, Texans Care for Children this fall in Austin will launch an interesting-looking three-part discussion series on drug abuse, families, and public policy. For state-level policy folk in Texas, it's a good time to be thinking about this sort of big picture analysis more than a year out from the next legislative session. Between Gov. Abbott vetoing Good Samaritan legislation in 2015 - and the Lege declining once again in 2017 to pay for expanded treatment services through reduced incarceration of drug users - it's pretty clear most Texas pols don't yet feel comfortable addressing drug abuse through any but a tough-on-crime lens. Advocates will need new strategies, alliances and messages to get much further. Is Texas on the way to fixing its death penalty? Finally, Pat Metze, a Texas Tech law prof, looked at criticism of Texas' death penalty system in a recent law review article and thinks the Legislature is on its way to solving the problem!! As luck would have it, your correspondent worked on many of the initiatives he's lauding - mostly innocence-type work - which he frames as responses to concerns raised in a 2013 American Bar Association report that was critical of several aspects of Texas' capital-punishment system. But the Legislature didn't view its innocence work through a capital frame, and it's at best a stretch to attribute anything they did as a response to critics of capital punishment. By contrast, most of those innocence reforms could only be passed because they weren't framed as specifically affecting capital cases. For the most prominent example, the Texas state fire marshal ultimately was happy to correct erroneous arson science and conduct a comprehensive review of disputed cases. But initially, debates over arson science were framed around the case of Todd Willingham, who was executed based on flawed arson testimony in the face of his claims of innocence. The resulting culture-war brouhaha nearly caused then-Gov. Rick Perry to disband the Texas Forensic Science Commission, the FSC's general counsel revealed to a recent national gathering. That pattern has been consistent - reforms can often happen in Texas if they're not about the death penalty or other hot-button culture-war topics - which is why it's odd to portray Texas as acting specifically to correct flaws in the capital punishment system. Given that the US Supreme Court has taken to bench slapping the Lone Star State two or three times per year on death-penalty matters (e.g., Moore, Buck, etc. ), the perspective Prof. Metze offers here definitely qualifies as a revisionist view. A capital-attorney friend who'd seen Metze's article told me it made her "blood boil." In that light, I teasingly asked Grits' contributing writer Jennifer Laurin, one of the authors of the 2013 ABA report, whether this means "Mission Accomplished!" She responded, "The short answer is that Texas has made big strides on innocence reform, and continues not to touch anything that redounds to the exclusive benefit of capital defendants. And actually I think the analysis in the article bears that out." More on this later, for sure, but I wanted to flag the link. warehousing non-violent offenders is costly to Midlanders, does not contribute positively to public safety, and does not lead the perpetrator to take responsibility for their actions. Violent offenders, on the other hand, need to be tried expediently and incarcerated sufficiently to protect the community. Long-time readers will recall that former Midland County Sheriff Gary Painter was the state's foremost advocate of regional narcotics task forces, which were defunded and closed by Gov. Rick Perry after a series of scandals beginning with the Tulia drug stings. Those entities were all about rounding up the maximum number of low-level drug users for incarceration. So the fact that the DA in Midland opined in the newspaper against "warehousing non-violent offenders" demonstrates the terms of debate are changing around the justice system and prosecutors' role. Fifteen years ago, this would have been a highly controversial stance; today it's almost a snoozer. And, to be sure, Nodolf's reformist tendencies pale compared to some of the suggestions by DA candidates in Brooklyn. I don't want to overstate the case. But overall, it's remarkable that a Midland Co. DA would feel any inclination to tip her hat to reform themes, and evidence that prosecutors around the country are reacting to reform proposals much differently and more thoughtfully than in the past. Grits has been thinking a lot lately about the question of whether adult justice systems sufficiently address the needs or adequately assess the likelihood of rehabilitation for offenders in 17-25 years old range, particularly after our Reasonably Suspicious podcast segment on the topic last month. During the 17-25 year old period, and particularly before age 21, neuroscientists now understand that young brains have yet to finish developing, especially as it relates to cognitive reasoning and impulse control. And some national experts have persuasively argued that the justice system needs to more effectively accommodate those differences in brain function. For the first time in a generation, Pennsylvania prisons are releasing convicted murderers by the dozen. In the last year, 70 men and women — all locked away as teens — have quietly returned to the community after decades behind bars. They're landing their first jobs, as grocery store cashiers and line cooks, addiction counselors and paralegals. They are, in their 50s and 60s, learning to drive, renting their first apartments, trying to establish credit, and navigating unfamiliar relationships. They're encountering the mismatch between long-held daydreams and the hard realities of daily life. These are the first of 517 juvenile lifers in Pennsylvania, the largest such contingent in the nation, to be resentenced and released on parole since the Supreme Court decided that mandatory life-without-parole sentences for minors are unconstitutional. The struggles facing these parolees perhaps are to be expected. If you'd been incarcerated since Smokey and the Bandit was in theaters, you'd face difficulty adjusting to 21st century America, as well. Regardless, "So far, not one of the 70 has violated parole." Perhaps that should be expected, too. As it happens, murderers have among the lowest recidivism rates. And the judge out of Kentucky whom we discussed in our podcast cited this study in his ruling to say that, "ninety (90) percent of serious juvenile offenders age out of crime and do not continue criminal behavior into adulthood." There are a few different ways one could take into account these differences in youthful brain chemistry, and likely more Grits hasn't considered yet. My old pal Vinnie Schiraldi has suggested creating a separate third system to deal with 18-25 year olds (it'd be 17-25 in Texas, where we have not yet raise the age of adult culpability to 18). Elsewhere, some states like Connecticut are considering expanding their juvenile justice system to cover offenders up to age 21. Alternatively, Schiraldi has privately suggested to Grits that perhaps certain enhancements, barriers to reentry, etc., could be eliminated or reduced for younger offenders since their likelihood of rehabilitation is so much higher. I'm sure there are other ways to skin this cat. We're on the front end of a national conversation about these topics spurred by recent scientific advancements. The suggestions for how to accommodate this new information remain prefatory and barely formed. But over time, as scientists better understand the human brain - and as the justice system slowly but surely adapts that knowledge to inform its various functions - it's not difficult to imagine major implications for these observations about brain development in a justice system based on identifying and punishing bad decisions, even if we can't say for sure what they'll be yet. That said, inevitably, someone's parole will be revoked among this Pennsylvania cohort. The road to reentry is too difficult (as this article effectively described) and the array of humanity caught up in the system is too diverse for it to never happen. But prisoners who've served decades until they're now old men (and to a less common extent, women), especially if they had good behavior records while inside, are remarkably safe release risks compared to many younger inmates convicted of less serious offenses. When Grits first began focusing on inequities in bail and pretrial detention back in the mid-aughts, insiders understood I was writing about real issues that needed addressing. But the response from the MSM and the public amounted to crickets chirping. Nobody outside of the insiders - who had to grapple with the daily reality of a failing system, even if the outside world hadn't noticed - seemed to care about locking defendants up for no other reason than that they were too poor to pay a private bail bondsman's fee. Back then, when I'd try to get reporters interested in these topics, they'd inevitably tell me, "But the bondsmen do the job for free, they're the free market solution to pretrial release." I tried to point out that it's not free if their clients are housed in jail at taxpayer expense until they choose to use their services. Plus, most absconding defendants are recaptured by law enforcement (at traffic stops, etc. ), not bail agents. On their face, the bail-does-it-for-free arguments never made any sense. They fall apart the moment you actually put numbers to any sort of cost model. But those simplistic arguments kept reporters from taking on these issues, and those of us criticizing money bail were portrayed as unrealistic and extremists. For an overview, check out this Washington Post editorial, "Fixing the unfair bail system is worth the costs." FWIW, the District of Columbia has already successfully gotten rid of money bail in most cases. In New Mexico, voters approved bail reform but prosecutors are seeking to undermine it by overusing preventive detention mechanisms. So far, only 11 of 95 preventive detention requests have been approved, the rest denied, which is being taken as evidence that prosecutors are asking for detention in cases where defendants deserve release. Here's a local story about bail-reform efforts in St. Joseph County, Indiana. Wired magazine has a story about bail-reform efforts in New Jersey. In California, promising bail reform efforts blew up and won't be revived again until 2018. Because women are disproportionately impacted, some groups are seeking to put their stories at the center of the bail reform movement. A Mother's Day action this year in which advocates bailed out moms so they could be home with their kids continues to resonate with positive reactions. For others, of course, it's an issue primarily for people of color. However, conservatives also support bail reform because, jailing poor defendants is a "stale practice that isn’t adapting to modern realities" and "a costly burden for local governments." At Fox and Hounds Daily, a retired 32-year Idaho sheriffs deputy makes the case that, "Bail reform restores basic American values of freedom and justice." Finally, this strange column in the Houston Chronicle repeats the free-market-does-it-better trope and claimed that eliminating money bail for misdemeanors in Houston had "eliminated 80 percent of the private bail bonds business," quoting a local bail agent. Grits would have to see that figure documented independently to believe it - it sounds like overstated hype. But there's no doubt reform has cut into the bail industry's business. Now it's time to finish the job. Any way you slice it, the bail industry's anachronistic economic interests damage the public weal. Their main counter-argument seems to be, "Corporate welfare made us rich, don't end it." But judging from the tenor of the national conversation going on right now, that sentiment doesn't seem as convincing to opinion leaders and the public as it did back when your correspondent began writing on the subject. When disasters like Hurricane Harvey strike, inmates in coastal prisons and jails are sitting ducks unless the authorities in control of their fates take action to protect them. TruthOut has emails from inmates in a flooded federal prison in Beaumont showing inmates stranded and scared in desperate conditions. And in Houston, the county jail allegedly released prisoners from a drug treatment facility at the height of the flooding without money, clothes, or medication because officials couldn't feed or supervise them. After this episode, there really won't be any excuse going forward for coastal jails and prison units to have anything but fully operational disaster plans, including privately run units. That should have been the case after inmates were stranded during Hurricanes Katrina (New Orleans) and Ike (Galveston). But now it would be clearly negligent not to do so. The Texas Department of Criminal Justice appears to have done a good job evacuating inmates in harm's way. But the federal Bureau of Prisons clearly dropped the ball, and the Texas Commission on Jail Standards surely should review policies on releasing inmates into hazardous conditions. It's a safe bet Harvey won't be the last time these issues come up. RELATED: Add accountability to rehab, reentry arguments for inmates' access to email. MORE: According to the Houston Press, federal officials disputed the extent of the flooding reported in Beaumont. Year-to-date crime is down, but should reformers tout it? The 2017 murder rate is projected to be 2.5 percent lower than last year. This year’s decline is driven primarily by decreases in Detroit (down 25.6 percent), Houston (down 20.5 percent), and New York (down 19.1 percent). Chicago’s murder rate is also projected to fall, by 2.4 percent. 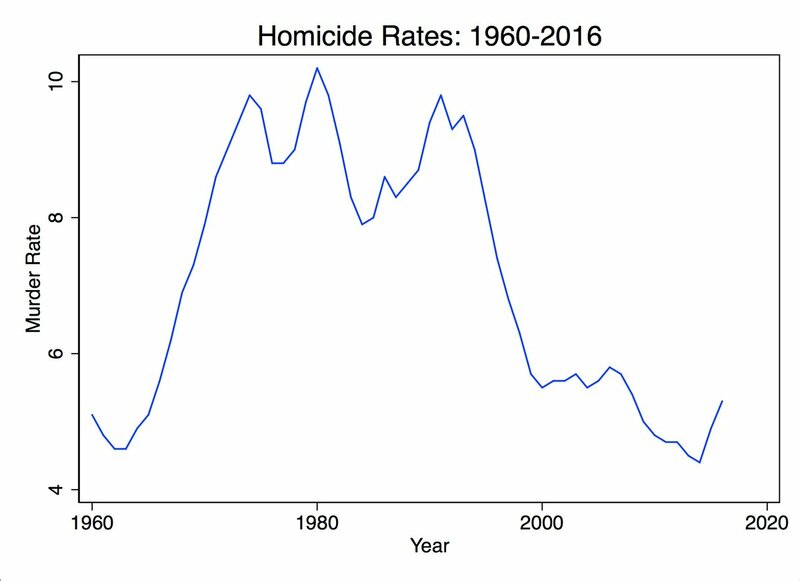 The 2017 murder rate is expected to be on par with that of 2009, well at the bottom of the historic post-1990 decline, yet still higher than the lowest recorded rate in 2013. The news will be widely heralded as a correction to slight upticks in violent crime in 2015 and 2016, casting doubt on the notion that the last couple of years represent some new wave of violence that justifies references to "American carnage," etc.. So perhaps Brennan's analysis will provide an antidote to those misguided memes. However, crime data such as these can only be meaningfully interpreted over the long term; short term blips tend not to tell us much, whether crime is going up or down. Grits feels the same way about Brennan's analysis as I did about a similarly themed Houston Chronicle story in July, which inspired a blog post titled: "Of journalists, drunks, lamp posts, and Year-To-Date crime data." Read that for more on my complaints about YTD crime data. Bottom line: Criminologists have shown what veteran crime reporters have known for years: that such short-term analyses of crime data don't tell us very much and are often wrong. They remain popular, though, because daily media outlets have news holes to fill, August is a slow news month, and crime reporting remains a staple. It may not be probative data, but it's new. And new fulfills a certain need for content producers in both traditional and digital media. In a sense, I'm glad Brennan has taken on this project. Doing it every year provides some uniformity to the analyses over time, whereas otherwise the data are framed by whichever reporter from some random news outlet thinks to do the story first. But I still question the overall value of year-to-date crime data analyses, and worry that Brennan's project improperly validates their use. Reformers should take opportunities like this one to critique misguided uses of crime data during periods when the data "help" us - as when crime is declining - because bringing it up for the first time when crime rises will raise understandable skepticism as to motive. Grits has been at this for quite a while and, in my experience, error helps nobody in the long run. The benefits that come from relying on bad data which appear to "help" my side are far outweighed by the cost of relying on it when it runs the other direction. Crime data are used by demagogues to inspire panic, and insisting on their proper, in-perspective use, whether that helps or hurts one's "cause," in the long run will improve the culture surrounding these debates and lead to better outcomes. Critiquing the misuse of data only when it damages your "side" reduces one's credibility. Criminal-justice reformers would be wise not to fall into that trap. This newsclip included quotes from Garcia's speech. Interesting note from Stout's presentation: He said the HFSC has gotten along well with the Houston Police Department, but the police union had been the source of most of the friction. The union v. crime lab tension hadn't occurred to me before. Garcia suggested that the adversarial legal system stands at odds with improving forensic science, citing the FSC's experience with the Todd Willingham arson case as a prime example. Her description of the DNA mixture issues we've been discussing recently begins at about the 1:41:00 mark. RELATED: Forensic bite mark analysis takes another hit in an article using its failures to highlight "the weak scientific culture of forensic science and the law’s difficulty in evaluating and responding to unreliable and unscientific evidence." The Urban Institute explored that path of inquiry even further. They "looked at the 10 percent of the prison population in each state serving the longest terms ... In most states, the average time served by the top 10 percent rose much more sharply relative to the rest of the prison population." Further, they found that these were the results of policies enacted by Legislatures: "These steep increases over time and the variation across states points to the power of state-specific policy decisions." So the claim that reformers are wrong to focus on length-of-stay doesn't hold water. Ditto for the suggestion that reformers should abandon efforts to reduce sentences legislatively in favor of focusing on District Attorneys and the rate at which they prosecute cases. Length of stay matters, says the Urban Institute data, and so does legislative policy. The uptick in parole rates for violent offenders in Texas had a number of causes. For example, Texas' 2007 reforms created new "Intermediate Sanctions Facilities" which, while much-derided by Andy Kahan and certain probation directors, have performed an important function of reducing the proportion of parolees revoked back to TDCJ to serve their full sentences based on petty violations or low-level crimes. Because those intermediate sanctions are available for most offenders, and because having a single, statewide parole agency contributes to a consistent, statewide policy, the use of ISFs has contributed to reduced revocation rates on the parole side to a much greater degree than for Texas probation departments. So a push that on paper was about "nonviolent" offenders turned out to adjust practices throughout the system that impacted incarceration for some people convicted of violent offenses as well. And since crime declined steadily in Texas throughout the period we're discussing, there's no reason to believe that this sort of managed reduction in incarceration levels threatened public safety. Bottom line, to reduce mass incarceration, there are two distinct categories of prisoners which must be addressed and which each require different strategies (hopefully executed simultaneously). There are 1) a small number of violent offenders receiving increasingly extreme sentences, according to the Urban Institute's findings, and 2) a vast number of low-level offenders, many of whom probably shouldn't be sent to prison in the first place, who contribute to "churn" in the justice system, filling county jails and stacking up third-degree and state-jail felonies. That second category is where the most important short-term reductions may be found. Again, from my April review: "the quickest way to reduce admissions is to reduce penalties along the margin between the lowest-level felonies (in Texas, state jail felonies), and higher-level misdemeanors (in Texas, Class As). These are almost entirely nonviolent drug and property offenses." But's it's also true that, in the long run, to get to mid-double digit reductions in incarceration would require lowering top-end sentences for people convicted of violent crimes. Mass incarceration does not have any one cause: Not just long sentences, not just mis-use of prosecutor discretion, not just erosion of Fourth Amendment rights in public interactions with police, not just false convictions of innocent people, but all of these and more have contributed to the problem. So walking back one piece of it probably will never amount to a cure-all. To reduce mass incarceration through the political process requires understanding all these different contributing factors, then engaging opportunistically whenever it's possible to address a piece of the problem. Texas isn't California, where a) a federal judge mandated incarceration reductions and b) reformers could put their own proposals on a statewide ballot for an up or down vote. In Texas, these reforms must occur through the democratically elected Legislature, and even in the 21st century, politics there remains the art of the possible. It would be nice if there were a silver bullet - reduce sentence lengths, rein in rogue prosecutors, combat discriminatory policing - but each of these by itself is a partial measure. It took 40 years for things to get this bad. There's no quick fix here. No easy answers. Today the New York Times and ProPublica published a joint investigation by Lauren Kirchner into the use of DNA mixture evidence in New York titled "Thousands of Criminal Cases in New York Relied on Disputed DNA Testing Techniques." The story covered some of the same ground as did a recent segment in Just Liberty's Reasonably Suspicious podcast discussing a DNA mixture case out of the Tyler 12th Court of Appeals here in Texas. Again, the government refused to hand it over on the grounds that it was a “proprietary and copyrighted” statistical tool owned by the City of New York. Nathaniel Adams, a computer scientist and an engineer at a private forensics consulting firm in Ohio, reviewed the code for the defense. He found that the program dropped valuable data from its calculations, in ways that users wouldn’t necessarily be aware of, but that could unpredictably affect the likelihood assigned to the defendant’s DNA being in the mixture. “I did not leave with the impression that FST was developed by an experienced software development team,” Adams wrote in an affidavit. Pending more rigorous testing, “the correctness of the behavior of the FST software should be seriously questioned.” Characterizing Adams’ criticisms as merely stylistic rather than substantive, the lab told ProPublica that FST provided reliable calculations. The issue of proprietary "black box" software interpreting DNA mixture evidence mirrors the situation with private vendors used in Texas like STR-Mix and TrueAllele, as discussed on the Reasonably Suspicious podcast. When New York's proprietary software was picked apart by the defense, they found previously unrevealed errors and flaws. Who's to say that won't also be the case with proprietary private software? The likelihood surely is greater than not. Courts should allow defense experts access to the source code if they're going to admit DNA mixture evidence from these black box systems. There's just too much recent error and loads of evidence that the math and science involved in these black-box interpretations are well beyond the ken of most analysts seeking to interpret them. The FBI in May claimed to have validated STR-Mix for use in DNA mixtures involving up to five people. But having a law enforcement agency "validate" the method is far different from having validation from independent sources which would satisfy defense experts. In one famous case out of upstate New York, STR-Mix and their main competitor, TrueAllele, tested the same evidence and came back with different results. "In the past three years, flaws in DNA methods have temporarily shut down testing in public crime labs in Austin, Texas, and Washington, D.C."